She is a Certified End of Life and Pet Grief Support Coach, Certified Pet Funeral Celebrant, Animal Medium and Communicator. She is the founder of The Center for Pet Loss Grief and an international best-selling and award-winning author and speaker. My Cat Has Died: What Do I Do? 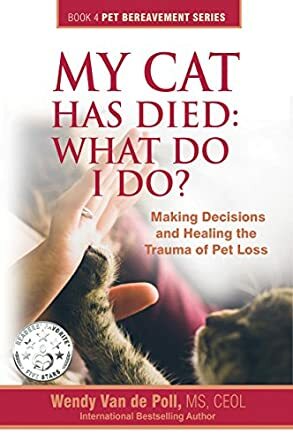 Making Decisions and Healing The Trauma of Pet Loss (The Pet Bereavement Series Book 4) by Wendy Van de Poll is a book for all cat lovers, and also for all those who are experiencing grief after losing their feline companions. The tools offered by the author help to support readers through their grief, and also guide them in dealing with all the changes one experiences after a loss. If your cat has died, if you are experiencing grief, and if you are keen on doing something special so that you will not forget your cat, then this is the best book for you. The author discusses the personal journey one goes through during this challenging phase, and the contemplation questions at the end will help a reader to proceed on their journey, personally and profoundly. The contemplation questions will make one look into concerns, fears, emotions, and thoughts, and will help readers connect better with their feelings. The author gives excellent suggestions and tips, and handles the topic very well so that the memories of a beloved pet give comfort. Losing a pet is always painful and the bond between humans and cats has been dealt with well. The book is good for all those who have cats as pets as it prepares them to cope with the loss of their pets when it happens. The book is original and the author handles a universal topic with expertise.